On this major U.S. shopping weekend I decided to boycott Wal-Mart. I'm proud to say I've never shopped in a Wal-Mart, and after watching "Wal-Mart: The High Cost of Low Price" I don't think you would either! The documentary is an eye-opening, multi-faceted argument against large corporations like Wal-Mart and how they exploit government subsidies and welfare to increase profits, flout laws and renege on obligations at the expense of residents and employees, both in the US and internationally. The list goes on, and on. It's a real "must-see" film. Come on, unsubscribe from the Wal-Mart e-letters...you don't need prices so low prices they cost you your community! 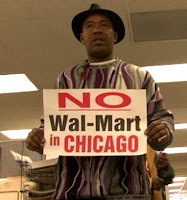 Do like Las Vegas, Inglewood, Chandler, Carlsbad, Albuquerque...and just say "No" to Wal-Mart! Today's Black Friday in the US. It sounds aminous, but it's a retail term for when the P&L turns from red (loss) to black (profit). Yes the sales are on in full force! Black Friday made me think about all the effort put into creating consumer demand. Look at the craziness in sneakers. Boutique stores now have sway with brands and create their own line of limited edition shoes. One which made me sigh was "legendary American footwear manufacturer" Saucony and Boston's Bodega. Midtown Remember when you'd see Saucony in the bargain basement in NYC's VIM?! I wouldn't even look at those! So now, suddenly they're all hip from a revamp with "new updated classic crafted with materials including reflective 3M and ballistic nylon contrasted with premium leathers?" Hmmm, I'm listening. ..."retailing for $125 Bodega offers a set of matching apparel (Jacket $85/Cap $35) scheduled to launch Saturday November 8th, 2008 11:00am at Bodega and will be offered as a package for $225 USD while supplies last." Hhahhahaha. Where's the candid camera?! I accidently left my car unlocked this week for a couple of days and some enterprising fella passed by and stole my CDs and a bag of parking meter change! Awesome! But why did he leave my GPS gadget and the $28 in the ashtray? Dumbass! Now I remember...I saw the guy! He was the tall white dude who I bumped into as he came from the back of the building. I said "hello" and he just gave me a sour face. Then he walked up the street. But then he crossed the street and walked back in the other direction. Weird. And definately the odd behavior of a opportunity thief on the move. I've never thought of myself as an illegal immigrant, but these past few weeks have been agony as I wasn't sure my 'status' was going to be renewed. Just to let you know, my visa ran out on November 18th. Yes 7 days ago! But the I-94 was valid until November 28th. Thankful I was pretty close to being sought after by the US immigration department. Now I have status until 2011...it seems long, but it ain't! Some of the hassle was self-inflicted due to me declaring I'm a 'manager' level employee, but in the eyes of US immigration I'm not. Whatever. So, to stay strong I wondered what Bruce would do...? He'd play ping pong! The only digging I regularly do now is on the web and I found this gem of a video on another b-boy afficinado's blog. It's a dope documentary featuring legendary hip-hop producers Prince Paul (De La Soul, Handsome Boy Modeling Club), Marley Marl (Juice Crew, Roxanne Shante, Biz Markie) and 45 King (900 Number, Lost Breaks). It's the holiday season, but from the emails I've received this week it seems the poor economy's taking a chunk out of the travel bookings and holiday cheer! This month, Farecast tells me that despite holiday travel costing ~35% more than last year (probably due to increased gas prices) something odd has happened at the end of October. There's been a turnaround as fares have dropped as we enter the holiday and Christmas season and fares have actually fallen below last year's prices?! Now, it's safe to assume lower oil prices ($50 a barrel now from its peak of $145) may be the reason, but the truth is consumer confidence is at an all-time-low! And connected to this squeeze is a tightening of the belt that's even affecting Vegas vacations. The hotels are already taking action. For CES in January 09, the hotels are cutting their losses and have dropped their prices by <$75. Even so, right now I think I'm going to skip CES and use the company's money more conservatively. So, no AVN either ;) The end of a tradition! 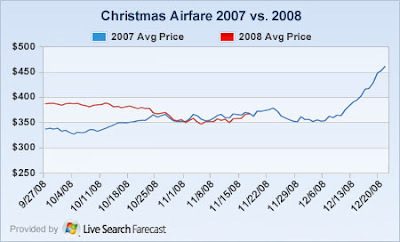 See below Can you can guess where the price line will plot from now until the end of 2008? A new indy b-boy film has gone straight to internet (rather than straight to DVD/video). The producers (CAID Productions, 800LB, Popcorn Productions) have created a unique 82-minute film that's both a feature-length film and also edited into 11 chapters/lessons that can be watched as stand alone episodes so you can learn the art of b-boying. "Way of the B-Boy" is described as a documentary and instruction course all in one. Let's see if that works, but we know CAID has high production values from its "Just for Kicks" documentary. 80s, 90s, 00s Three generations of b-boys are interviewed about breaking and its evolution. Bboys Jeromeskee (Massive Monkees Crew, Rock Steady Crew) and Fever One (DVS, Rock Steady Crew) start with the most basic step, then reveal the moves and demonstrate how they are put together in combinations - in the original way that hasn’t changed since the 1970s. The old skool lessions come from forefathers of hip-hop and New York breaking pioneers such as Lil Lep, Michael Holman, Pop Master Fabel, Grand Master Caz, Sugar Pop and Mr. Wiggles. I don't get it One thing that I'm confused about is Coosh's involvement in this film. Their headphones are linked to b-boy battle competition and prizes so they must be sponsors or something. Headphones = music = breaks = b-boying. Ahhh. I get it! The other week I got all nostalgic about the Bristol and old skool hip-hop scene and wrote about c.1985. One of the YouTube clips that sparked off the post was a Newtrament vs. Wild Bunch warehouse jam. 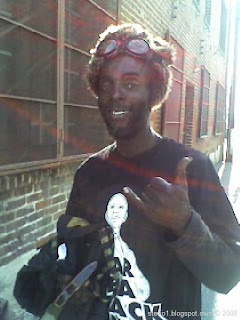 Little did I know that as I was driving around LA last week would I meet Newtrament himself!? It was odd. You couldn't make this up, seriously! It all began as I was returning to my hood where I spotted a familiar looking face hanging out having a conversation about Turntable Lab. He certainly sounded English and with the gold teeth caps he was certainly a b-boy. Only in LA? I almost drove off pondering the rare sighting, except the stranger beckoned me over. Now, I say he looked familiar but I didn't know who he was and nothing clicked until the man said he had a record deal with Jive (do they still exist?) and a record called "London Bridge". Abracadabra! "Are you Newtrament? ", I asked. He's been here 17 years...yep, he's been on the west coast since 1991! "Why? What are you doing? Who do you hang with? ", and many other questions were answered as we chatted for 30 mins or so. It's a documentary! I told Newtrament to write a book. This brilliant blog explains the formative years of UK hip-hop and the strong US connections way back in the 80s. If you're not familiar with Newtrament's 1986 electro jam featuring Sir Drew (who still lives in west London) here it is courtesy of a fan and YouTube. Had to share this...Tina asked me about The Roots hip-hop band and I went off on a rant about Breakestra. These LA peeps dig in the crates and keep the party rockin' with their live covers of classic breaks. Can you name those tunes? As I was surfing around I spotted another collaboration from a couple of brands. One who has a firm grip on the street youth, Nike, and another who is reinventing itself to get respect from the trendsetters, Levi’s. But the news that the Nike Jordan x Levi's special project to release a (sold out) pack consisting of AJ1s made of Levi denim (printed with the Jordan elephant design), a t-shirt, and a crisp pair of 501s wasn't interesting to me. What was interesting was the way the marketing teams 'conspired' to create the excitement and sales momentum for this initiative. The youth can't survive this barrage of marketing. May be I'm still sensitive from reading Jennifer Government that Britt lent me? "I am very curious to see how this turns out. It sounds great on paper, but if there is one criticism I have had for Jordan over the years it is their denim...The problem to me has never been material, it has been cut and logo placement. Hopefully they designed with the idea that less is more...My favorite pair of jeans to date are the Stussy/Levi’s anniversary joints with the metallic silver stitching on the back pockets." To promote its limited edition 23/501 jeans and shoes online, Levi Strauss wanted to go beyond the usual, often boring advertising banners. The Plan: launch a widget campaign that capitalized on the target consumers' penchant for social networking. Avenue A/Razorfish and Gigya created a widget chock full of unreleased hip hop tracks by popular artists. This new music made the widget more likely to be shared with friends. A sense of urgency was added by including a two-week countdown ticker that tracked how much time remained before the clothes were available for sale on March 1, 2008. The widget also included the locations where the special collection would be sold, product shots, and a customizable space where widget users could leave personal messages. 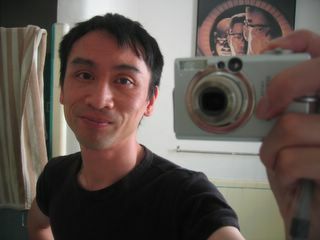 The widget was launched on Wildfire, Gigya's widget distribution network. Banner ads also drove traffic to a Web page featuring the widget. The Results: the 23/501 Collection sold out in less than 50 seconds. The countdown ticker had consumers lining up moments before the products became available at Levi stores in Chicago, San Francisco, Santa Monica, Calif., and New York, plus NikeTown outlets in Beverly Hills, Calif., Chicago, San Francisco and New York. Levi.com also sold a limited inventory. The widget averaged 10 views of product shots per installed widget and was sent to more than 2,000 friends. Interactions per impression were 20.8%, much higher than the 3% average that rich media banner ads deliver. The big tune of the summer was Wiley (Dizzee's mentor) and his cover of DSK "What would you do?" I've been listening to it. I've been a bit baffled by the video and now I'm posting the l-u-g-e Hot Chip and Wiley performance at Glastonbury this past August. This might be my first purchase on iTunes (UK)?! Hot Chip is an electronica band who covered Wiley's version on BBC Radio 1's live sessions for Jo Wiley. The bridge at 2.03 minutes brings in Hot Chip's vibe into this grime tune. I missed out on a great film. Laemmle's sent me an invite to "A Very British Gangster" which is the new documentary from Donal Mac Intyre which showed at Sundance this year. The film follows the British gangster, Dominic Noonan, on a three-year journey in Manchester where he plys his trade. As you'd expect, the commentary has bitter sweet messages about Noonan's role in society as he dishes out his own brand of justice and Neighborhood Watch that the police and authorities cannot. Some see him as a gangland enforcer and others as a neighborhood fixer. I believe I've seen Donal Mac Intyre's work before when he was a BBC investigative journalist. One-time tried to track down a stolen mobile phone to show the trade of goods in inner cities. His candid camera footage showed him getting a knife pulled on him by an 'helpful citizen' and having his laptop stolen. Here's the finale of Fox TV's "Hell's Kitchen 2". It's emotional. Check out the episodes from series 2 on alluc.org from 2006 (I know I'm lame). It was filmed on La Brea Ave. a few minutes from my apartment. It didn't get to eat there (may be thank goodness?! ), but I have been to Gordon Ramsey at The London in West Hollywood. Oh my word...Bristol 1985...Hip-hop ya don't stop! The Wild Bunch inspired all my Bristol homeboys...and then they amped it up and took it to London...Fresh. See the middle video for Newtrament vs. The Wild Bunch, London 1985. And the video of Freestyle 1985 in Covent Garden brings back memories. I jumped on the train to London and went to a youth club to pick up my tix from DJ Pogo as I remember. Triple FAT Goose...back on the block! Were you in New York back in the late 80s and early 90s? 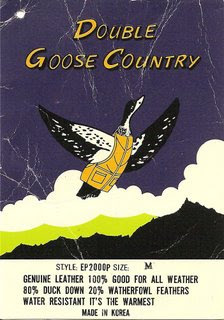 The Double Goose Country was hot, but then came the Triple FAT Goose brand. I bought my first Triple FAT bomber jacket (too big) from SPE Sports in Ladbroke Grove, London. Then another one on Fordham Road in the Bronx, but this time a long black cotton parka that was on the cover of III Most Wanted's album. You remember ;) "Calm Down"! 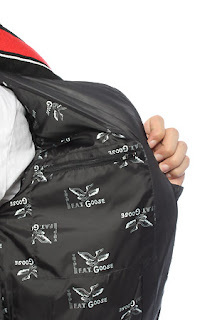 Revival So, anyway I got an email telling me Triple FAT has been resurrected and the jackets are in stores now?! Wahhhhht?! 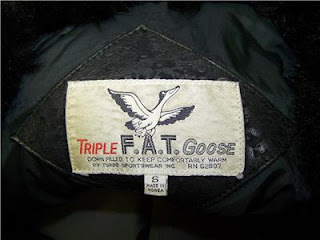 "Once king of the goose down game, Triple FAT Goose's ending their fifteen year hiatus and bringing the Fall/Winter line online for the first time today, merging functional outdoor gear with modern fashion to heretofore unseen success that totally freaks out geese." Now it's been a few years, but I haven't grown much since the 90s and I'm still a size "small", so the Dr. Jays "large" won't be getting my business...not even a Hong Kong tailor can help alter these babies. Hahaha. Know what I'm sayin'? Even though I'm in LA where it doesn't get much cooler than 15c I still fiend after the goose downs. I got myself a Double Goose Country from the 90s with the bubble stitch to add to my collection. But I'm still seeking the bubble or v-stitch vest. For the 5th year running the UK has the highest number of cocaine sniffers in Europe!? What the hell...I don't disagree...it's the exception to find Brits of my generation who aren't on something on the weekend! Here are the numbers 7.7% of Britons aged 15-64 have taken cocaine - rising to 11.2% for the 15-24 age group and 12.7% for the those aged between 15 and 34. But which other countries are deviants? Spain comes second and Ireland fourth. And blow's not all the Brits love. Shadow Home Secretary, Dominic Grieve, commented: "This report confirms Britain's status as the cocaine capital of Europe, not to mention the fact we also have the highest prevalence of amphetamine and ecstasy use amongst adults. It is particularly disturbing that we have the highest proportion of fifteen and sixteen-year-olds using cocaine..."
71 million Europeans have taken cannabis or one in four citizens! Home Office said, "We continue to focus our efforts on reducing the harm caused by illegal drugs through tough enforcement, education and treatment". The Streets, the Heritage Orchestra...?! Sounds like an ill gig. This "once in a lifetime" concert happened last month, but sadly, I was nowhere near Camden Roundhouse. Damn, man! I did go to the Proms back in the 90s at the Royal Albert Hall. It was a great spectacle of classical music. So, I love that the BBC has taken the Proms into the 21st-century with the Electric Proms series. These videos are pure class. And it doesn't slow down. Coming soon are N.E.R.D. and Grace Jones! This is history folks...unbelievable! Rock the Obama mixtape here courtesy of Russell "Rush" Simmons and DJ Green Lantern. Win or Lose These speeches show the true character and spirit of these men. Can't hate on them! The youth have been running with Obama this whole campaign...Let's see if the Stussy, Upper Playground, Z-Trip, Obey etc. crews made a difference and can celebrate after the votes are in!? Stussy Party With EF Crew from Expressive Frontier on Vimeo. T minus 24 hours! Will these shirts from Digital Gravel be collectors' items or thrift shop booty? For a look under the covers, you have to leave it to the geeks in da hiz-ouse! Last word But, I gotta say it...where's the wifi? !